Sydney is a gleaming cosmopolis, a city surrounded and defined by seawater. Water taxis and ferries supplement buses, threading the cobalt waters of Sydney Harbour, a long finger stretching west to characterful inland suburbs. The distinctive Opera House and Harbour Bridge, and the historic, hilly Rocks area punctuate a waterfront CBD (central business district) that’s home to a lively cafe culture, art galleries, green spaces, food markets and skyline bars. Meanwhile, on the coast, beach communities such as Bondi and Manly are the cradle of an outdoorsy, active and yet laid-back lifestyle that has become the quintessential Australian identity. With clean, surf-fringed beaches and a buzzing cosmopolitan atmosphere, Sydney can be both a relaxing escape and a fast-paced wonderland in the same day. It’s this that makes it, for me, one of the best cities in the world. Its once controversial and now familiar design has become iconic, but glimpsing Sydney’s World-Heritage-Site performance venue for the first time is still startling. First, there’s its size — its naval-inspired, Expressionist Modernist ‘sails’ soar to a height of 67 m (219 ft) above sea level. Getting up close to the structure, you’ll suddenly see that each sail is covered in thousands of faintly pinkish tiles. It’s as impressive inside as outside: backstage tours reveal the labyrinth of dressing rooms, orchestra pits and green rooms normally off-limits to the public. You’ll also get access to the stages (of which there are over seven) and see the thousand-piped Grand Organ that sits in pride of place in the cavernous concert hall. A pleasant contrast to the hubbub of the CBD, this path runs between the beach suburbs of Bondi and Bronte, and continues farther south to the town of Coogee. Sometimes, it hugs the clifftops; sometimes, it comes level to the wide, sandy beaches that, in summer, are speckled with surfers and families. In places, the storm-lashed, honeyed rocks bordering the path have been eroded into spherical hollows — some so big you can almost climb into them — and pockmarked with rock pools. Far-reaching views across the Tasman Sea accompany you the whole way. It’s not for vertigo sufferers, but a journey to the summit of the through arch bridge affectionately nicknamed ‘the Coathanger’ offers arguably the best views of Sydney. At the crest, standing under the Australian flag and buffeted by wind, you look down upon the Opera House in a 360-degree panorama of Sydney Harbour. Attached to a static safety line, you walk through the bowels of the structure, past the immense rivets and steel pins originally imported from England. From here, it’s a climb up a not-too-steep series of steps leading up the outer rim of the bridge. Along the way, guides tell you tales of the original construction workers, including the story of one man who miraculously survived a fall from the bridge by virtue of some quick thinking. Pulling his boot off mid-plummet, he threw it before him to break the surface tension of the water below. As Sydney Harbour ferry routes go, this one is hallowed: for over 150 years the yellow-and-green Freshwater ferry line has been carrying visitors and commuters alike from the bustle of the CBD’s Circular Quay to the relaxed, arty suburb of Manly. The journey takes you east, skimming past the Opera House (remember also to look back to see the entire span of the Harbour Bridge behind you) and almost out to the open sea before heading north. On docking, you can make for Shelly Beach, a west-facing cove protected from the winds that often rip across Manly’s ocean side, making it a good spot for swimming and snorkeling. Sitting on a peninsula adjacent to the CBD’s nest of skyscrapers, the Rocks is a time portal, a remnant of Sydney circa 1788 when the first British convicts landed in the area. Its rabbit warren of cobbled streets is criss-crossed by passageways, alleys and steep stairways, all crowned by the grassy knoll of Observatory Hill. Gentrified wharves — now home to sleek modern apartments — and upmarket galleries mingle with shabby, convict-era street-corner pubs, and battered storehouses, cottages and townhouses. Some are now museums, preserving 19th-century life. The precinct’s Aboriginal heritage also rings out, reflected in the dual language street names. This area of lush parkland and cultivated gardens begins footsteps away from the Opera House and sweeps around Farm Cove, a tidal inlet with a protective sea wall. It’s a waterfront oasis that plays a large role in Sydney life. Families come to picnic or relax in the shade of its palm groves, while runners pound its trails at dawn, dusk, in their lunchbreaks… in fact, at any time of day. A walk following one of the park’s paths may lead you past glasshouses of begonias and orchids. Other features include ponds brimming with lotus flowers and the oldest tree in the world, the Wollemi pine. As you explore, your eyes (and ears) are drawn skywards, where you’ll notice that the treetops are alive with squawking cockatoos, lorikeets and the elegant, ever-present Australian white ibis. Head west out of Sydney and you’ll reach this mountain range that rises 1,000 m (3,280 ft) above sea level — it’s a rugged wilderness merely an hour’s drive from the city. The range gains its name from the blueish haze created when light catches the oily eucalyptus trees that blanket its slopes, valleys and ridges. It’s possible to visit for a day from the city, keeping an eye out for wallabies hopping through the undergrowth, walking short trails and stopping off at lookouts. One of the most well-known vantages is the tiny but visually rewarding Eagle Hawk Lookout, which offers a close-up view of the Three Sisters, sandstone pinnacles jutting up from the Jamison Valley. Taking to the water is compulsory if you want to get a feel for Sydney. One of the best ways of seeing the city from the vantage point of the water is to take a small group boat tour around the Harbour. Sailing on a 16 m (52 ft) motor yacht, you’ll take in the Opera House and Sydney Harbour Bridge, the former penal island of Fort Denison, the leafy suburb of Rose Bay, and the battleships moored at the peninsula of Garden Island, the main navy base for Australia’s east coast. Cruises include an on-board guide, who is able to point out the key sights and insert a little fun Sydneysider knowledge (telling you, for example, which Australian public figures own which extensive waterfront properties). Some cruises include morning refreshments; others serve a three-course BBQ lunch with wines. There’s also sometimes the option to swim from or fish from the yacht. Springtime (September to November) brings mild weather and sees the Royal Botanic Garden at its best. Summer (November to February) is a time of high temperatures — ideal for hitting the city’s beaches. In April the city erupts with festivals and events of all kinds, including The Championships horse races. Sydney always welcomes New Year’s Eve with exuberant celebrations, including fireworks over the Harbour Bridge. If you’re planning to see in the New Year in Sydney, and are coveting a view of the fireworks, be prepared to book your trip as far ahead as possible in order to secure your spot in a property with views of the bridge. of our Australia clients would recommend us to a friend. Our itineraries will give you suggestions for what is possible when you travel in Sydney, and they showcase routes we know work particularly well. Treat them as inspiration, because your trip will be created uniquely by one of our specialists. 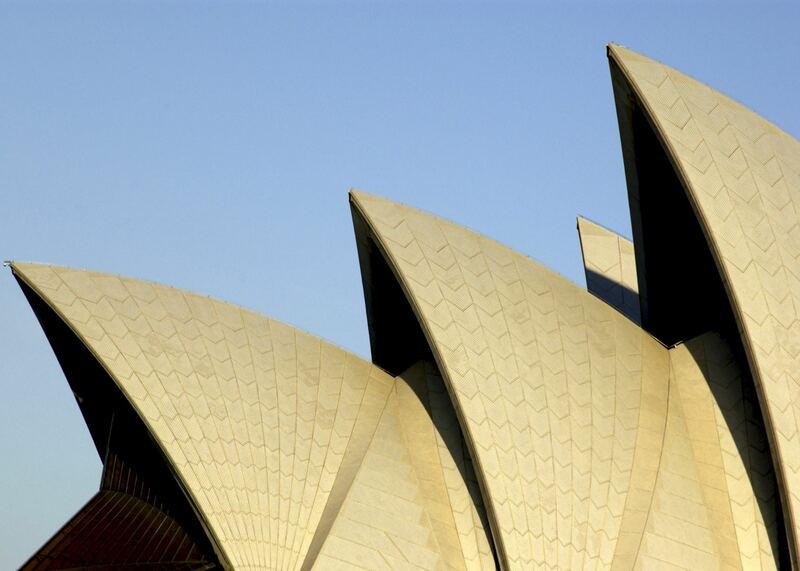 We’ve selected a range of accommodation options for when you visit Sydney. Our choices usually come recommended for their character, facilities and service or location. Our specialists always aim to suggest properties that match your preferences. One of Sydney's finest hotels, The Langham is perfectly positioned near the historic Rocks district, Darling Harbour, Circular Quay and all of the city's main highlights whilst being tucked away on a quiet street, offering a peaceful retreat from the hustle and bustle. Located in Sydney's vibrant and historical Rocks district, just a short walk to the Opera House, Circular Quay and Harbour Bridge, the Shangri-La towers above the city, boasting excellent views from its spacious rooms and suites. A high-rise hotel with slick contemporary design, spacious rooms and a wide range of facilities, the Amora Hotel Jamison offers good value for money and a convenient central location. Quay West Suites have an enviable location overlooking Sydney's Rocks district and offer all-suite accommodation with superb five-star hotel service..
Set on the eastern shore of Circular Quay, the superbly located Quay Grand Suites offers spectacular views of Sydney's famous harbour, Opera House, Royal Botanic Gardens and city skyline. Located in Darling Harbour the 114 one bedroom apartments and studio rooms offer excellent accommodation that is an easy walk to Sydney's major tourist attractions, entertainment venues and some of the best shopping. Our specialists seek out authentic ways to get to know the places that could feature in your trip. These activities reflect some of the experiences they've most enjoyed while visiting Sydney, and which use the best local guides. The Sydney Harbour Bridge Climb has become a legendary activity for any visitor of Sydney. The three and a half hour excursion takes you over the arch to the summit of the famous Sydney Harbour Bridge, giving you wonderful 360 degree views of the Harbour, including the iconic Opera House. Visit an ancient Aboriginal site, get shown some outstanding look out points, examine rock formations and the unusual plants and wildlife that abound the area. Jump aboard a 16 m (52 ft) motor yacht and embark on a four hour cruise taking in the famous sights as well as the lesser known coves and beaches of the harbour in Sydney. This intimate tour is unique in that you have exclusive access to areas normally reserved for the stars and their crew. You will be taken backstage of one of the busiest performing arts centres in the world as it prepares for the upcoming performances.